$100 Minimum Order! All Our Prices Are Wholesale! To shop in our showroom, bring your State Business License. If you are tax exempt, you must bring your current State Re-sale Tax Certificate. Since 1971, Atlantic Coral Enterprise, Inc. has been an importer and distributor of wholesale seashells, bulk starfish, bulk sand dollars, shell jewelry wholesale, shark teeth necklaces, alligator tooth necklaces, alligator heads and shell gifts for beach decor and shell collectors. 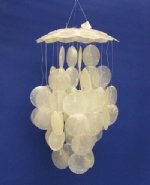 Whether you are looking for large decorative seashells, shells for crafts, coconut jewelry, shell jewelry boxes, shell ornaments, shell chimes, seashell chandeliers, shell mirrors and picture frames or other shell souvenirs and novelties, you will find it at Atlantic Coral Enterprise. We also sell wholesale beach supplies, such as wholesale bodyboards and skimboards, 30 x 60 fiber reactive beach towels and beach games. We carry a wide assortment of carved coconuts, shark jaws, sea urchins, purple barnacles, and blowfish. Looking for wholesale animal skulls, animal horns, bones, animal skins, hides, quills and mounts? We also sell animal skulls with horns, wholesale animal skins and hides from Africa and Finland, animal skulls wholesale, animal bones, hippo tusks, warthog tusks for carving, African porcupine quills and animal mounts. Worldwide Wildlife Products is our animal products division. All our merchandise has been cleared for legal entry into the U.S. by the U. S. Fish & Wildlife Department and U.S. Customs. We have all required governmental licenses and permits. All products will have a label "Made in India”, "Made in Philippines”, etc. These labels are a requirement of the U.S. Customs department and state the country of origin of the product. They do not mean the item was "manufactured”. All our products are natural.